Genea-Musings: More Searching for Eulalia - Curiouser! FIXED! I wrote Something's Wrong With Ancestry Pennsylvania Death Certificates Search on Monday. 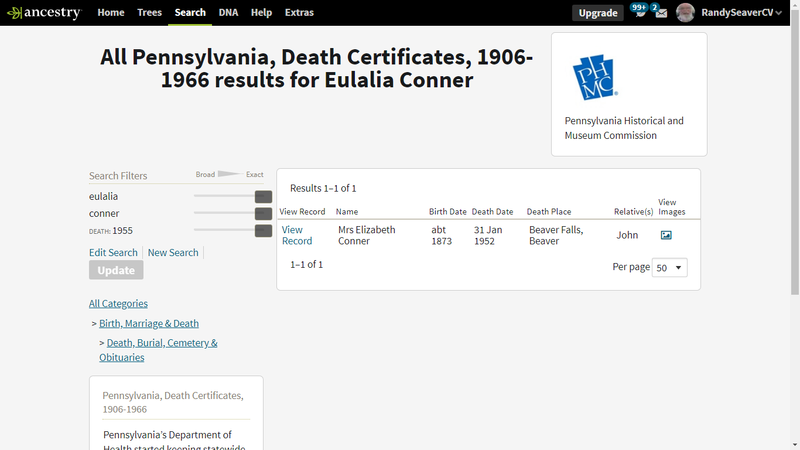 In that post, I found that some searches for persons in the Pennsylvania Death Certificates collection on Ancestry.com were not found by a search of the specific database. 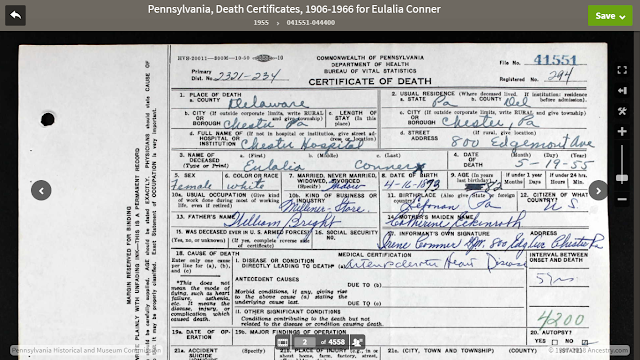 I don't know how many can't be found, but the one I chose, randomly, couldn't be found, even though it was in the database (I posted an image of the 1955 death certificate for Eulalia Conner. Yep, that's her!! So searching for a person from the general search page works. 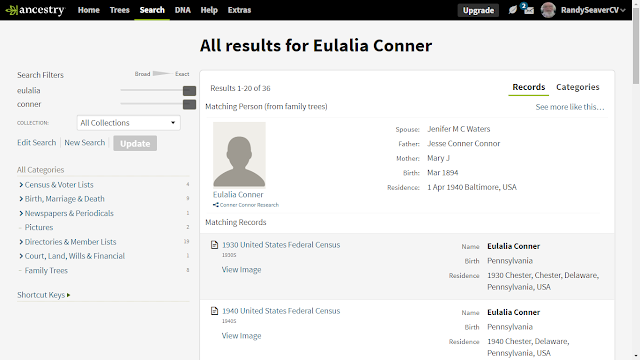 It found "Mrs. Elizabeth Conner" again like the earlier post. It still doesn't find the right person when I search in the specific database. 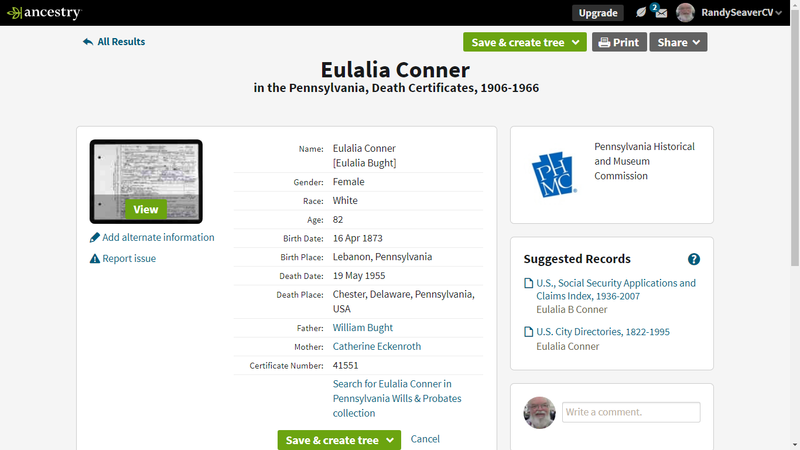 I searched using only the first name "eulalia" and "1955" and it didn't find her. 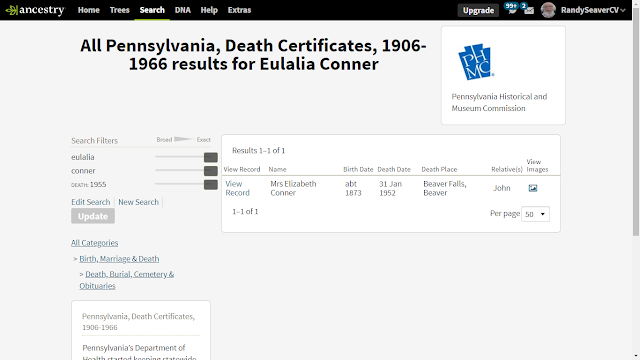 It did find "Mrs. Elizabeth Conner" again. It's curious, isn't it? Strange, too. How does this happen? UPDATED 13 April 2018: My reader also emailed the Pennsylvania Historical and Museum Commisson (PHMC) on 9 April, and they responded saying that they were aware of the problem on Ancestry. Today, the problem with the search and index for this record collection on Ancestry.com was fixed. I've been trying some simple searches on Ancestry.com for the last couple of days, and not getting results I know are there. I have no personal knowledge, but I suspect they're having some problems in linking their databases to the search tools.